Tumbleweed offer a wide selection of plants, with the majority of our plants hardened on site, therefore well suited to our environment and coastal conditions. Our overriding objective is to provide customers with honest advice and good quality at realistic prices. We can provide anything from one punnet of vegetables to a full garden design and planting. Redeemable at all good garden centres nationwide. We have an extensive range of pots. Some imported from Vietnam and Malaysia and Italy and some local designs. We are very fortunate to be exclusive agents for Loris Horton local artist and sculpture, fabulous one off garden sculptures. We also have locally made pots inlaid with paua. 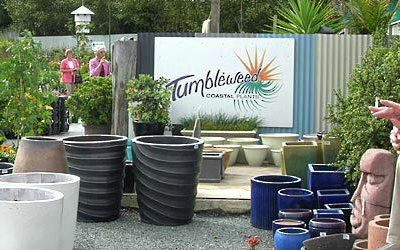 Tumbleweed first started business in Matakana 2000, relocating to its present site 2 years later. 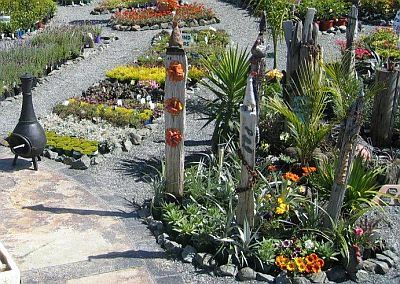 The garden centre incorporates a full landscape supply depot, as well as a complete landscape service, from landscape design to installation. © Copyright 2014 Tumbleweed Coastal Plants. All rights reserved.